Glenavon have completed the signing of Carrick Rangers defender Andrew Doyle. 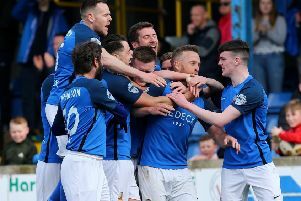 Manager Gary Hamilton believes Doyle will be a vital addition to the Lurgan Blues with Conor Dillon unavailable next season following his move to Australia. “Andrew has many of the same attributes that, in my opinion, made Conor one of the best centre halves in the league last season,” Hamilton said. A former Glentoran Colts captain, Doyle has previously had spells with Ballyclare Comrades, Lisburn Distillery and Amateur League sides Rathfern Rangers and Nortel. He has put pen to paper on a one-year deal at Mourneview Park where he will link up with his former Ballyclare team-mate, Joel Cooper.